Something nice and easy like this, leading economists say. 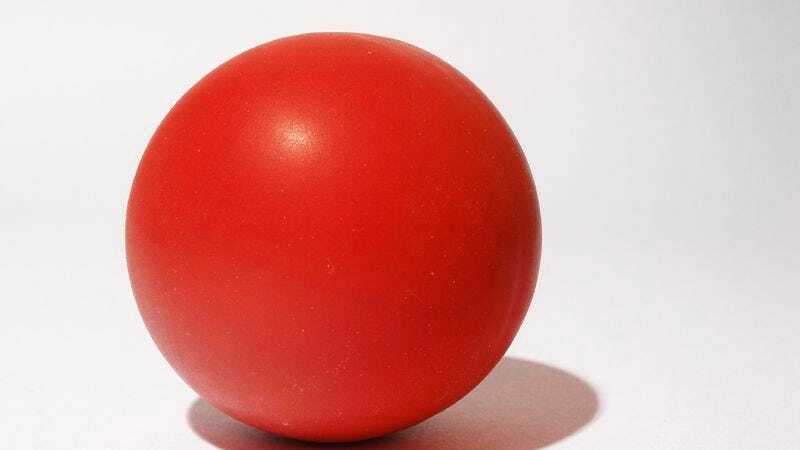 WASHINGTON—After conducting an in-depth analysis of the nation's industrial output and long-term economic future, leading economists delicately suggested this week that maybe American manufacturers might want to think about abandoning their current products and start over with something nice and simple, such as a ball. Claiming that the nation's standing within the increasingly competitive global marketplace was perhaps not what it once was, the economists gently encouraged American producers to "wipe the slate clean" and rebuild their confidence by starting fresh with a plain, basic ball. "You really shot for the moon and tried to do something grand, and we think that's just great," read a statement from the American Economic Association that was addressed to the nation's manufacturing sector. "But let's face it, the whole American manufacturing thing hasn't worked out quite as well as we'd hoped, so we think there's no shame in just paring down your ambitions slightly and focusing on making a really good ball, no more, no less. How does that sound?" "Just give it a shot; it couldn't hurt, right?" the statement continued. "We think you'd be really good at it." Echoing the AEA's statement, economists nationwide have carefully prodded manufacturers to adopt the ball-making plan. They have reportedly advised producers not to worry themselves with complex questions of whether the ball should be hollow or solid, suggesting instead that they focus solely on believing in themselves and making the best ball they can. "American manufacturers are ambitious and they're naturally going to want to add flashing lights and microchips to the ball," said industrial economist Rick Mattoon of Northwestern University. "But we think it would be a good idea if they fully mastered the fundamental aspects of the ball before moving on. For example, manufacturers should ask themselves, 'Is our product round? Does it roll?' If not, then they should just keep at it—we know they'll get the hang of it eventually." "Once they've demonstrated proficiency, then they can try something more ambitious, like a red ball or a green ball or even a ball that bounces," Mattoon added. The AEA also proposed that U.S. manufacturers convene at a central location where they could all learn the ball-making procedure up close, with each company having the opportunity to observe and participate in the assembly of a ball before returning to their own factories to attempt the process themselves. A guide released by the AEA not only provides step-by-step ball-fabrication instructions, but also contains supportive and encouraging language aimed at instilling in manufacturers the idea that they are every bit as deserving of success as rising industrial powers such as China and Brazil. "As long as everyone tries their hardest at making a good ball, there's no reason the U.S. can't reemerge as a world-class manufacturing nation," AEA vice president Timothy Bresnahan said. "Optimistically, by the end of the decade we could see a flourishing industry that produces everything from a dowel to a cup to a different-sized ball." The response within the American manufacturing sector has thus far been overwhelmingly positive, with hundreds of aerospace, home appliance, and electronics corporations readily discontinuing their more complicated products in favor of a simple little ball. "We switched our equipment over to ball-production two days ago and things couldn't be going better," said Daniel Akerson, chairman and CEO of General Motors. "We're making 15 tons of balls a day, they're coming out nice and round, and we're just overjoyed with how much we're accomplishing. I'd completely forgotten how great it feels to make a product you're actually proud of." As of press time, all 4.1 million balls so far produced by U.S. manufacturers had been recalled for posing a choking hazard and leaching dangerous toxins.